Does anybody else long for the days when elected leaders would lie through their teeth and rarely live up to their policy pledges? A simpler age when the basest of campaign-trail bluster was treated by those it wasn’t intended for with comforting contempt. In the ivory towers and inner-city cafes, there’s been commonly held knowledge for a while now that politics is a game played by elites, the goal being to trick the citizenry into appropriating power to one of usually two teams, before they go on and do whatever appeases their donors and the party faithful. We bemoan it, but we’re used to it; representative democracy, when played out in this manner, is more or less predictable, with conflicting interests, power brokers, lobbyists and party factions keeping everything in a modicum of check. But now, the days of predictable politics are over. While it only takes a rudimentary grasp of history to expect campaign promises to be broken in government, others seem to be astounded when they inevitably are. Opposition politicians unashamedly rail against the government’s inability to stay true to their wildest attempts at appeasing disenfranchised swing voters in “battleground” states, while knowing full well that they’re intending to employ the same level of deceit if and when they secure power. For too long, the political establishment was afforded the ability to treat the electorate with contempt, and they took advantage of it to the extreme, and so it was only a matter of time before the people made it clear that they wouldn’t stand for more dishonesty. We wanted our politicians to do precisely what they say, and now we have, terrifyingly, gotten our way. Trump and his team know how to work their rabid supporter base. Their surprise victory was due in no short part to his appealing to the basest instincts and fears of American society’s very broad fringe. The outrageous promises and stances Trump was elected on seemed to be obvious lies, the brazen big talking of a showman and a con artist hoodwinking the more gullible traits of an entire nation. He would never go through with it, we assured ourselves. It was just too insane. Team Trump, as we’re increasingly coming to expect, had different plans. They knew that they’d whipped their supporter base up into a frenzy that would revolt and bite them on the arse if he then went on to act like the Clinton-esque establishment politician his campaign had railed against. Once the Republican Party was more-or-less appeased with his far-right, almost-conventional cabinet picks, the Trump brains-trust realised that even his more one-eyed supporters would realise that, instead of being drained, the swamp was filled with the ugliest monsters available. It was time to distance himself from the presidents who came before him, and ingratiate him as a man of the people with the lunatic fringe. 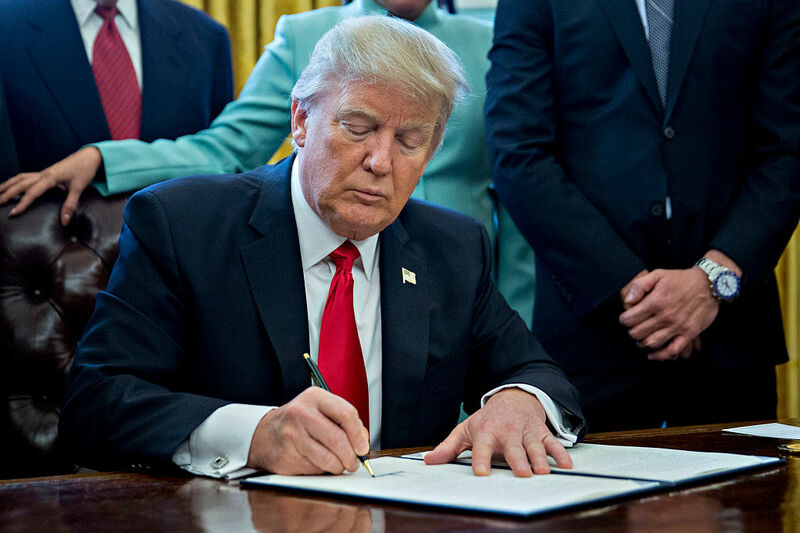 It was time to sign on some executive orders. What happened in the first 11 days of Trump’s presidency has been covered comprehensively, and with all the solemnity and humour it requires, we don’t need to rehash it here. While Obama also signed a number of executive orders, none were as far-reaching or divisive as Trump’s. He went all out, and his restrictive, irrational, far reaching and consequential orders were well received by the people who matter to Trump, those who voted for him. Finally a politician was doing precisely what he said he’d do, and how! With the stroke of a pen, he has given an intimation of honesty that we’re utterly unaccustomed to. By avoiding the processes of government, by acting on his pledges, Trump appears to be democracy manifest, a leader whose honesty takes precedence over all else. The reality, however, is that he is borrowing heavily from the Putinesque dictators’ handbook; Trump is giving the impression of democracy, of honesty, to mask the absolutely arbitrary, self-serving and autocratic nature of his actions. In a representative democracy the President needs to act within some established parameters, many which seem to put the will of the people a distant, apparently undemocratic, second. The various factions within the president’s party needs to be appeased and concession needs to be reached with the opposition (especially when the opposition controls the senate and/or the house); donors and special interest groups must be consulted, lest the politician find themselves at an economic disadvantage come the next round of vote coaxing; the desires of the electorate has to be considered in a manner that acknowledges the general public’s lax powers of comprehension — and all this while trying to determine the course of action that will best serve the national interest. Because of the plethora of parameters, leaders like Barack Obama will act seemingly outside of their nature or against their beliefs. They will do things that contradict previous pledges, because democracy isn’t as simple as one man doing whatever he wants. To everybody who complained while the Obama government continued meting out America’s often-bloody foreign and domestic policy, the supposed truth we’re experiencing under Trump is for you. From what we’ve seen so far, Trump is ready to stay true to his policies at any cost. This is what “honest” democracy looks like, a series of insane edicts free from checks and balances, at the whim of a leader whose idea of transparency is to practice in-front-of-closed-doors Twitter diplomacy with traditional partners and enemies alike. Someone like Trump supposedly saying what they think, publicly, is not transparent governance. It’s a calculated act designed to whip the populace into a frenzy. Don’t trick yourself into thinking that Trump is the first politician to act for the good of the nation, and not the retention of power — it’s just that his mechanisms of deceit are different than those we’re used to. Trump’s executive orders, while being undemocratic, are the logical conclusion of a representative democracy that took its citizenry for granted and treated people like votes to be appropriated. The only solace to find in all of this is that logical conclusions generally herald the end of things; we just hope without reason to do so that democracy’s swan song is swift and relatively bloodless.